Is China trying to divert the Brahmaputra waters to its dry north and north-western regions? Or, is it merely trying to build small dams along the river? The Government of India seems clueless if SM Krishna’s recent remarks are any indication. Can the country afford to ignore such a momentous issue? Sometimes news found in the mainstream Indian media can be flabbergasting. Take the case of the purported ‘diversion’ of the Yarlung Tsangpo. A ‘serious’ national newspaper spoke of the “Yarlang Tsangpo, it is what the Brahmaputra river is called in Mandarin”. Yarlung (not Yarlang) Tsangpo is the Tibetan name for the river originating near Mt Kailash. It has nothing to do with Mandarin. Great news, but the NRSC scientists are wasting their time looking for structures near the Grand Bend of the Brahmaputra. In reality, the diversion is planned a few hundred kilometres upstream, near the city of Tsetang in Central Tibet. It seems the Ministry hasn’t done its homework before sending a request to NRSC. Also, External Affairs Minister SM Krishna is not a good student. He mixes the ‘diversion scheme’ with the dams being built on the Brahmaputra. While answering a question on the diversion, he affirms that Zangmu Dam “is no cause of concern to India as it is a ‘run off the river’ dam”. In fact, Beijing is planning a string of six dams in this area — Lengda, Zhongda, Langzhen, Jiexu, Jiacha and Zangmu. There’s no need to mention here the utopian dream of a 38 GW power station (nearly twice the size of the Three Gorges Dam) in the Great Bend, near the Indian border. There are too many geological and technical issues involved to be taken seriously in the decades to come. The smaller dams (about 500 MW each) are not directly linked with the diversion scheme, which is proposed to be built a few hundred km upstream. It would make no technical sense to have such a project at a relatively lower altitude near the Great Bend, when the waters can be pushed up towards the north from a much higher altitude, near Tsetang. Headlines Today mentioned a confidential report prepared by the Cabinet Secretariat in Delhi on June 13. “Beijing is not responding to India’s concerns on the Brahmaputra dam. There is an urgent need to take up this issue with China as these dams will ‘severely impact’ the flow of water into India,” the report says. According to the same source, Krishna would assure Assam Chief Minister Tarun Gogoi that “ISRO satellite maps showed no construction”. But that’s not true. 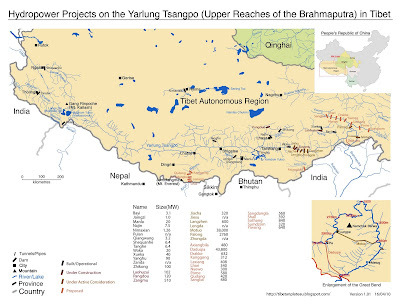 On November 15, 2010, The People’s Daily had announced: “The Brahmaputra river, which has long been praised as a ‘heavenly river’, was dammed for the first time on November 12... the Zangmu Hydropower Station, the first large hydropower station in Tibet, will soon begin its main construction.” In fact, the construction began several months earlier. Let us, however, go back to the source of the ‘diversion’ story. A couple of weeks ago, Prof Wang Guangqian, a senior scientist at the Chinese Academy of Sciences, was quoted as saying: “Chinese experts have raised a new proposal to divert water from the upper reaches of the Brahmaputra river to the country’s north-western province of Xinjiang”. Prof Wang’s project is a variant of a scheme prepared some 10 years ago by two Chinese engineers — Guo Kai, a retired PLA General, considered by many as the father of the mega scheme, and his colleague Li Ling, who wrote a book, Tibet’s Water Will Save China. The project was then called the Shuomatan Canal (from Suma Tan in Central Tibet to Tanjing in China). Interestingly, Wang seems to have the backing of Li Ruihuan, a former member of the Standing Committee of the CCP’s Politburo and former chairman of the Chinese People’s Political Consultative Conference. Many in the PLA as well as the mega dam companies are said to be supporting the project. Wang spoke about the proposed route: “Brahmaputra waters are expected to be re-routed to Xinjiang along the Qinghai-Tibet Railway and the Hexi Corridor — part of the Northern Silk Road located in Gansu Province.” He admitted, “We thought this would be a plan 50 years later,” adding that Chinese experts and officials are still studying the possible impacts — technical and political — of the proposal. Chinese engineers are clearly conducting a ‘feasibility study’, and no construction has started. But the project, planned to be undertaken in 50 years, might start much earlier. “Faced with severe challenges brought by reduced water resources and a severe drought that has affected a large portion of the country, China has started to consider diverting water from the Brahmaputra river,” said Wang. One can reasonably think that it would begin in 10 years at the earliest, keeping in mind the fact that it is a political decision which could only be taken at the highest level of the Chinese state. Wang admitted that his proposal, also called the Major Western Route, had been inspired by the work of Guo Kai. Fast developing China has less and less water and Beijing has to locate possible sources of water to survive. Scientists are looking in the only two possible directions — the sea (the Bohai Sea) or the mountains (the Tibetan plateau). Wang quoted a survey by the Chinese Academy of Sciences showing that “rivers on the Qinghai-Tibet and Yunnan-Guizhou plateaus, including the Yarlung Tsangpo, Salween and Mekong, carry between 637 billion cubic metres and 810 billion cubic metres of water out of China each year”. What disturbs some Chinese engineers is that most of these rivers flow down to India and Southeast Asia, becoming the Brahmaputra, Salween and Mekong; in other words, the waters are ‘wasted’ for China. The diversion project envisaged by Wang (and Guo Kai) could move some 200 billion cubic metres of water a year up to north-western China — the equivalent of four Yellow Rivers. According to Li Ling, the Institute of Advanced Technology at the Chinese Academy of Sciences is using supercomputers to simulate the project and evaluate the feasibility of the diversion project. Wang himself works with the South-North Water Transfer office to prepare a ‘scientific’ report. In 2006, the Chinese Government pretended that “a few mad men” were thinking of this pharaonic project. But if these few ‘mad men’ — supported by a former Politburo Standing Committee member — are able to use the supercomputers of the Chinese Academy of Sciences for their calculations, they may not be as mad as painted by the Government. Three important factors need to be understood. One, China’s hydropower lobbies have a financial interest in ‘concretising’ the project as soon as possible. Last week, an article in The Financial Times affirmed: “China’s Three Gorges Project Corporation has proposed a $15 billion hydropower scheme to Pakistan to dam the Indus river valley at several points, in a project aimed at controlling floods and tackling electricity shortages.” Dams, whether in Pakistan or Tibet, mean big business and the large Chinese corporations will continue to lobby hard to get these projects through. The second crucial factor is the cost-benefit perspective. The Chinese leadership has mostly been pragmatic. 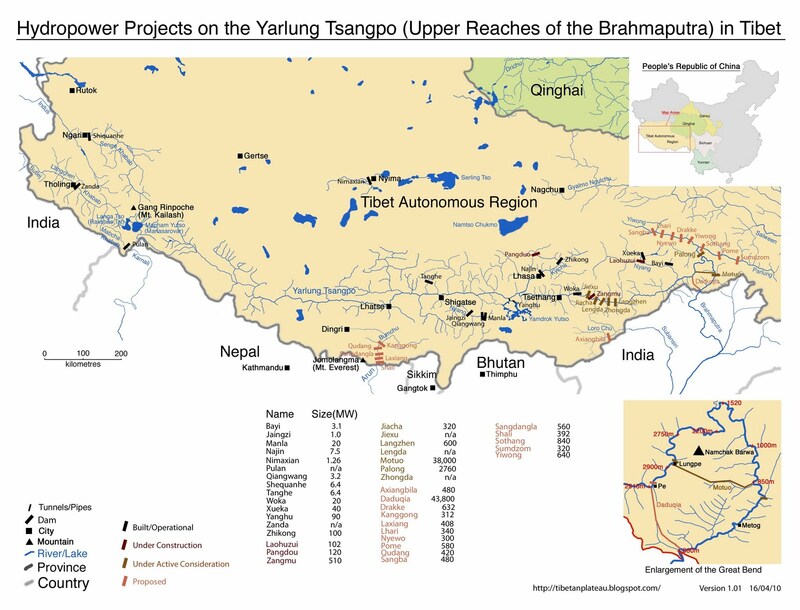 A friend who worked on the issue told me: “If the price of transferring water is cheaper than conservation or getting water from the sea, China will go ahead.” Why to divert the Yarlung Tsangpo and risk a conflict with India, if there is a possibility to avoid it? Three, China badly needs water and can’t import it. The diversion of the Brahmaputra is in competition with another diversion: From the Bohai Sea, the innermost gulf of the Yellow Sea on the coast of northeastern China and push it up to Xinjiang. But, why does China need water? # To stop the desertification in Xinjiang, Gansu and Inner Mongolia. # To help the dry and polluted Yellow river flow again. # To feed its people, for which large amounts of water are required for agriculture. If such grandiose and seemingly unrealisable projects are even thought of, it is because the situation is quite desperate and nobody is able to foresee any ‘realisable’ solution. So far, China has refused to collaborate with downstream states. In May 1997, when the General Assembly of the United Nations adopted a Convention on the Law of the Non-Navigational Uses of International Watercourses, China was one of three countries that voted against it. The rather mild convention “aimed at guiding states in negotiating agreements on specific watercourses”. In the long run, whether it will be by adopting such a convention or by signing a bilateral treaty like the Indus Waters Treaty (1960) between India and Pakistan, Beijing has no choice but to collaborate with its downstream neighbours on a crucial issue like water on which the future of Asia depends. The current ‘imperialist’ attitude does not tally with the status of ‘responsible power’ that China is striving for.